188 pages | 21 B/W Illus. Museums and Centers of Contemporary Art in Central Europe is a comprehensive study of the ecosystem of art museums and centers in the Czech Republic, Hungary, Poland and Slovakia. Focusing on institutions founded after 1989, the book analyses a thirty-year boom in art exhibition space in these regions, as well as a range of socio-political influences and curatorial debates that had a significant impact upon their development. Tracing the inspiration for the increase in art institutions and the models upon which these new spaces were based, Jagodzińska offers a unique insight into the history of museums in Central Europe. Providing analysis of a range of issues, including private and public patronage, architecture, and changing visions of national museums of art, the book situates these newly-founded institutions within their historical, political and museological contexts. Considering whether - and in what ways - they can be said to have a shared regional identity that is distinct from institutions elsewhere, this valuable contribution paints a picture of the region in its entirety from the perspective of new institutions of art. 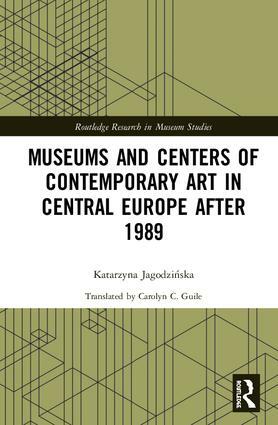 Offering the first comprehensive study on the topic, Museums and Centers of Contemporary Art in Central Europe should be of great interest to academics, researchers and postgraduate students engaged in the study of museums, art, history and architecture. 9. Museums of Central Europe: A Central-European Identity? Katarzyna Jagodzinska is an Assistant Professor at the Institute of European Studies at Jagiellonian University, Krakow, Poland. She is an expert in museum studies and the cultural heritage of Central Europe.